Beautiful pictures of nature ! Hi Ela, thankyou for your comments ! You have a nice weekend too ! Yes, the garden was mighty full of fallen trees for a while ! All sorted now, and the additional light is always a good thing ! Both clematis are excellent and I would highly recommend. Cirrhosa will squeeze into a small space , so there is always room for one! Oh please, I have fallen trees too on my garden this week. The windy downpour along this week make my little trees collapsed and then fallen. Are your clematis adaptable in warm area? They look so lovely. I want to grow it on my home garden. Maybe the can fill my empty wall. Hi Endah, oh dear... fallen trees for you too. It is always very sad to lose them. I honestly don't know whether clematis enjoy heat or not, living in the uk I never resallly have the chance to find out! Loved all your views. We don't really get to see huge seasonal changes here, so I've enjoyed the walk around your garden as it moves from winter to spring. Fallen trees can happen here quite a bit when it's a bad cyclone season and the winds are extraordinarily strong. Thankfully the cyclone season has been a bit of a fizzer this year. Our wet season didn't eventuate to much either, so it will be interesting to see how all my plants fare during our coming long dry season. Hi bernie, i have been following your wet season through your bog. I hope there is enough moisture in the soil to see you through the dry season. Hi Stephanie, it is SO exciting watching the fizzing in the borders ! The new shoots are so welcome right now ! If you are offering tea - no thanks but I'll have a coffee! I love images of reflections. Blue is always a tricky colour to photograph but things have improved since all blues came out purple as seen in earlier gardening catalogues. 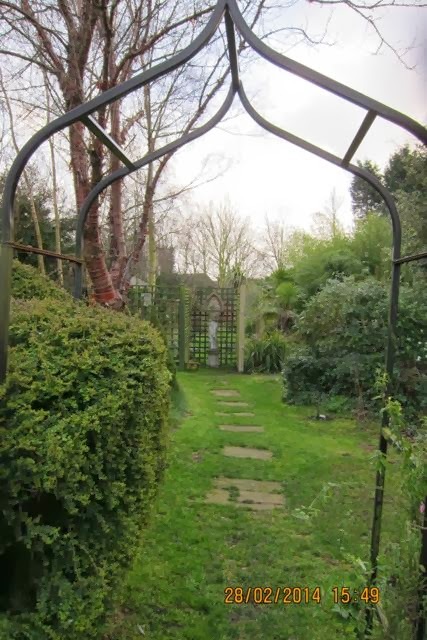 Lovely walk through your garden, thank you Jane. 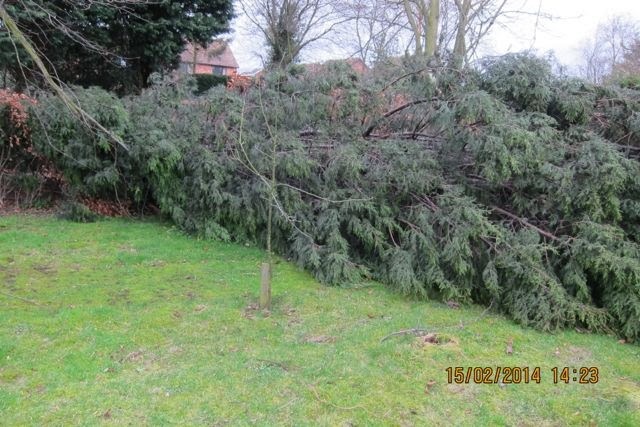 Trees down here too.. it's been quite a winter for storms! The Iris is beautiful and Clematis armandii is one of my favourites. Hi Rusty Duck, this winter has been a real test of root systems ! We have lost 2 huge old trees, which is very sad. Hi Jane, so exciting to see all the new growth and changes. 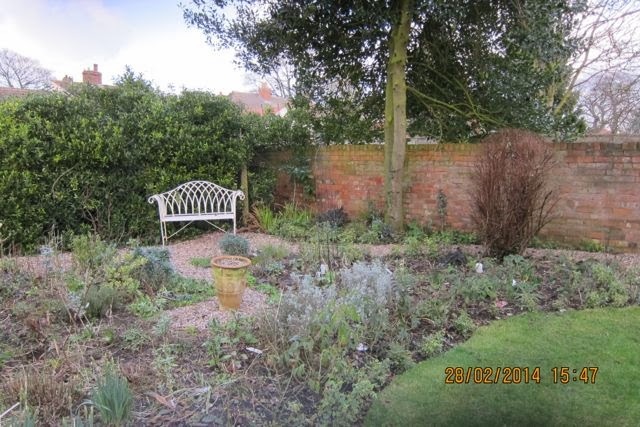 Lovely garden views. Hi Sue, thank you for your comments. It is a fantastic time of year! 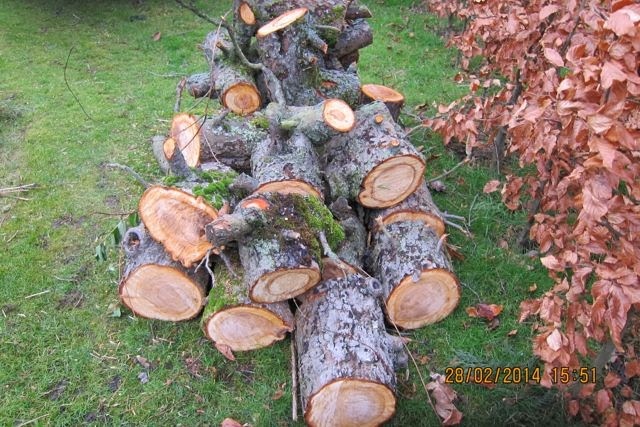 We thought the worst of the gales were over, but our neighbour has just lost a wonderful ancient oak a couple of days ago. I noticed today that we have frogspawn at last, it can't be long before you have some too. 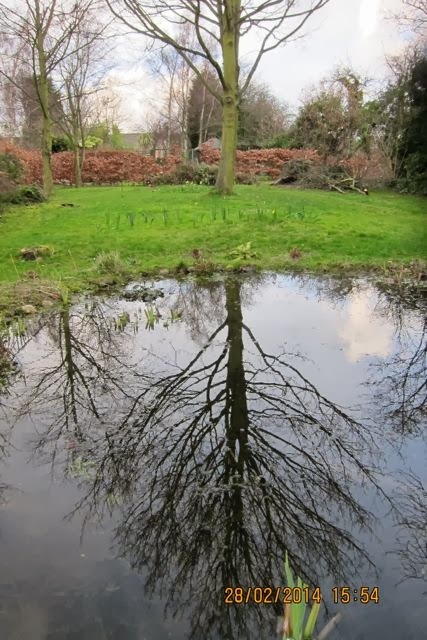 Ours is very late, usually the frogs arrive in February and we always have frogspawn by mid Feb. Hope that you now have and area to plant where your tree came down or will you replace with another tree? Hi Pauline, there are young fruit trees already planted in the orchard, in their third year, so they will take the place eventually of the old trees. 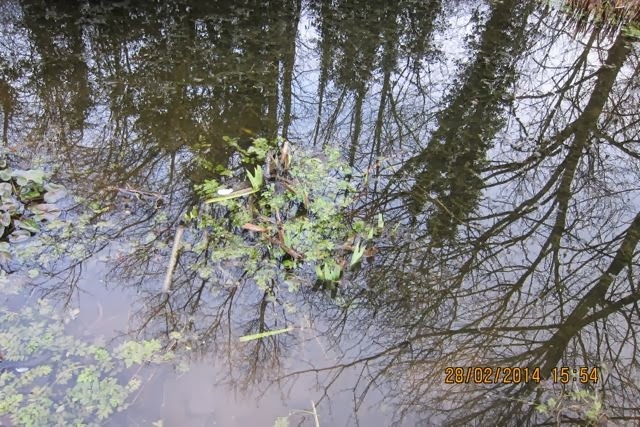 Frogspawn in February is very unusual for us, and it is nearly always March. So interesting comparing environments. Thoroughly enjoyed my stroll around your garden. Not such good news on those trees, great to read its all sorted now. What is it with men and their lawn mowers so early in the year - a friend of mine is planning to do his lawn this weekend. When I asked him if it wasn't too wet yet, he replied - it needed doing regardless of the squelch factor! So jealous of your Clematis armandii Jane - doesn't survive up here, although this year it just might have - we can't have it all! Hi Angie, Armandii hasn't made it through the season yet ! Fingers crossed !! Must be nice! Here on the Canadian prairie it's a little different. I still have 1-2 ft of snow in my garden, and last night it was -36 deg C.
When spring finally arrives we REALLY appreciate it. Wow! Minus 36 !! That is ridiculously cold . When does Spring usually arrive with you ? Spring is just starting now. Most of the snow has melted except in the shade (it snowed about an inch yesterday). What will happen now, there'll be a huge explosion of growth of native wildflowers over the next 2-3 weeks and then the perennials will start to emerge. A few of the smaller bulbs such as Siberian squills are starting to poke their leaves through now. Night-time temperatures will be below freezing until the beginning of June. Then by the middle of July there's no rain until October (this is a semi-arid desert). What with being at high altitude (a half-mile above sea-level) and a normal soil pH 7.8 (tap water pH is also 7.8-8.0), it is quite a challenge growing a garden here. I look at pictures of gardens like yours and can only dream. Boy do you guys have it easy! Wow! Those conditions are hard ! How do you even begin ? I moan about our climate ... how dare I ! Respect to you for persevering and creating a garden in totally adverse conditions ! I enjoyed the tour, and only wish I could drop by for some tea (and cookies, of course). 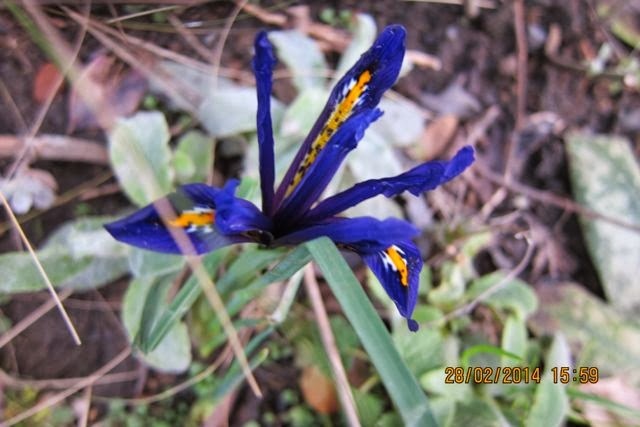 I was just out in my yard doing the same thing you were doing in this post - checking the new growth and thinking, any day now... My iris reticulata have popped and the daffodils opened today. Hurray! Yay Sarah! That obligatory tour of duty is so exciting, as it gives the opportunity to welcome back old friends. And, yes, I DO talk to them and say hello! Nice tour! Losing a tree can be traumatic, but it also opens up all kinds of possibilities. And 200 roses - lord, that's a very impressive number. I'm embarrassed to admit I have only four - Sally Holmes, Cassie, Strike it Rich, and a wild rose R. setigera. Hi, thankyou for your comments. You are so right ! Losing a tree = gaining more light = new possibilities! Four roses is probably a sensible number of roses to have ! About half mine don't really count as they are miniatures used as edging and underplanting, so quite teeny! Your garden is beautiful, and showing signs of spring growth...here we are flowing seamlessly from Winter, into more winter. But I can wander through your photos for enjoyment. Jen, you must have an extreme case of cabin fever being cooped up inside because of all that cold and snow! I bet you are itching to get out into the fresh air and GARDEN! Surely it can't be long now before spring puts in an appearance? I've loved the wander around your garden, Jane. I do envy you the prospect of frogs, although I've tried my best to encourage them into my two ponds here they still haven't been tempted. 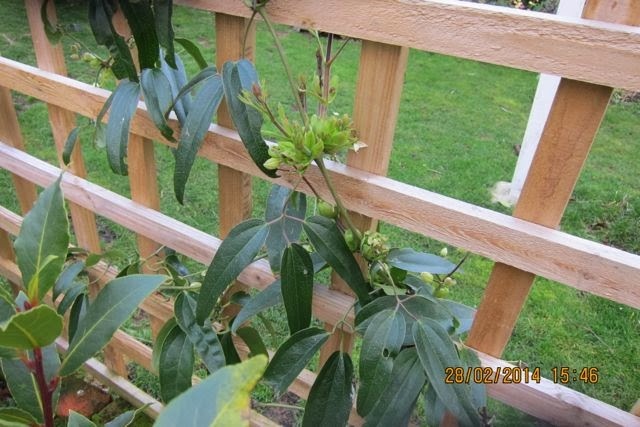 And it is lovely seeing the buds on Clematis Armandii knowing that it will be a mass of flowers. Hi Wendy,the frogs just came ! I didn't do anything to encourage them at all - no bribes or blackmail ! 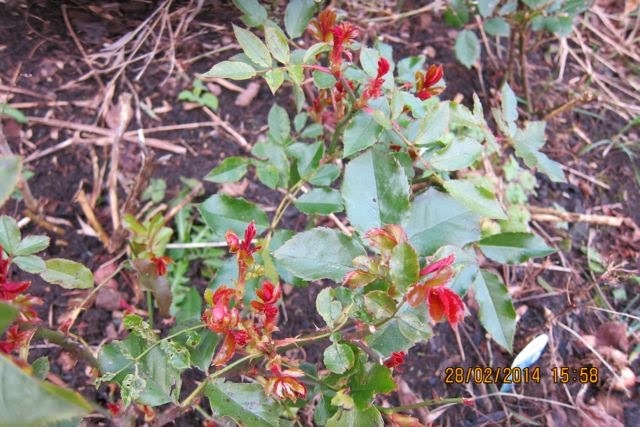 Oh Jane, so nice to see new red growth on the roses. I'm two months off from that, myself, but I'll keep dreaming while you show your first blooms. Hi Professor, that new growth is just too exciting for words ! Are you still buried in a snowdrift ? Hi Tammy, it would be so nice to have a real stroll together instead of a virtual one ! You have a heck of a lot of snow !! Hope it melts soon and gives way to gorgeous spring! I like my tea with a couple of teaspoons of sugar thanks. I wish I could skip the sugar, but I have a terrible sweet tooth, so while you are passing the sugar you might as well pass the plate of biscuits. How I envy you your mild winter! It is snowing here, if you can believe it, and spring is nowhere in sight. 200 roses! I am glad to hear that I am not the only one addicted to plants. I hope the frogs are hopping soon! Hi jennifer, well if we are having biscuits we may as well have cake ! I can't believe our luck with the winter so far. Only a few mildly frosty mornings so far. Surely we can't escape so lightly ? The roses are a bit of a cheat as about 100 are the same miniature rose, so not as good as it first sounds. Because I am a rose geek, I have just counted the number of different varieties (all written in my "Rose Book'!!) and it is 59. I need help! I am on constant frog-watch but nothing to report as yet! It's painful to think of a fallen Bramley. There will be a link box for Tree Following posts on Loose and Leafy tomorrow (March 7th). It'll stay open for seven days. Hi Lucy. thanks for that , it was kind of you to pop over to remind me ! I will get onto that! Still unsure which tree to choose, maybe the one with the most interest value ? Betula Jacquemontii, Prunus Serrula or a lovely native like the Elder ? Can't decide! I wish I could cut the grass here in my garden in Cheshire, it is still so waterlogged in places that I would be frightened of the mower sinking. I can't imagine how the poor people on the Somerset Levels feel. Hi Rick, I am surprised ours has dried out enough! 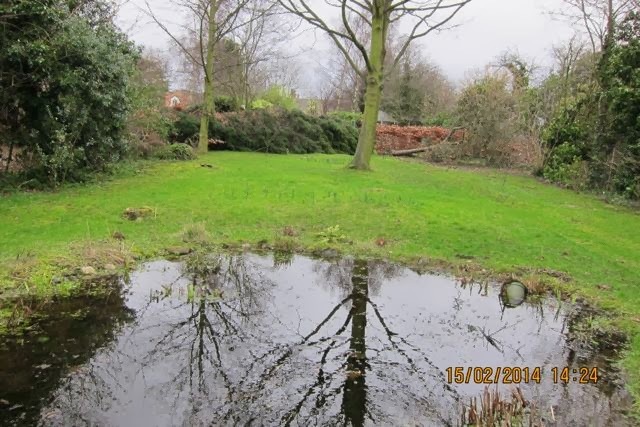 We are very lucky here, although there was dreadful flooding only about 1 mile away in early December. 600 homes flooded and totally ignored by the national media. Coastal surge which came up the Humber. It's been a beautiful day here today, spring has definitely sprung. I hope you've got some frogspawn in the pond now, I've seen lots of froggy 'action' but no spawn for me as yet. My pond is only tiny so I don't know if they'll use it this way or not, but I live in hope. Gosh Jo, you are lots earlier than us! I spotted the first lurking frog in the pond yesterday so should be spawn before long I hope. Hi Jane, I very much enjoyed the tour through your yard! Wow, you had quite a bit of storm damage to deal with, but you seem to take it with equanimity, which is great, of course. I don't know if it is just the photo, but the leaves of your 'Reine des Violettes' (I assume you are growing the Hybrid Perpetual rose) look much more shiny and leathery than mine. The one that I have in my garden has matte foliage. I wonder, if we are growing two different roses sold under the same name. Your rose truly seems to be happy judging by all the abundant new growth that it is putting out. 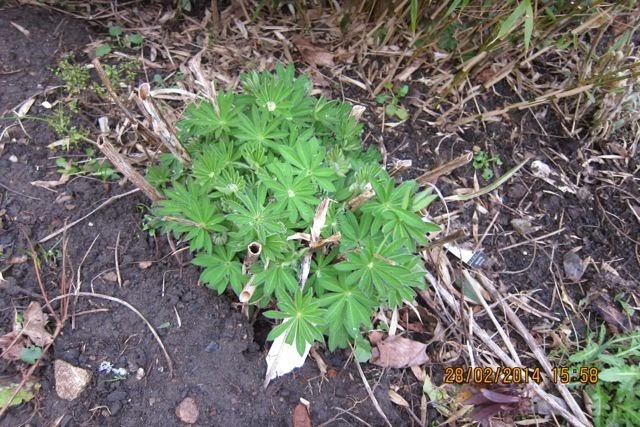 Mine is not that vigorous even after two years in the ground. I adore it anyway, the bloom color is just so unique and the fragrance absolutely wonderful. I love, love, love your iris histrioides! What a gorgeous little plant. I would like to find out, if it would grow for me here in Southern California, too. I definitively haven't seen it in other people's gardens in my neighborhood. Christina you are very astute, and have eagle eyes. I double checked and you are absolutely right - the rose in the photo is not Reine de Violette' at all, it is Caribbean Dream, a Patio. reine de Violette has no red new growth at all, but a soft matt grey/ green ! The iris is a new find for me, so I am not sure what conditions it prefers yet.